Jupiter cycles exert a very powerful influence upon history. Some astro-historians feel that Jupiter exerts an even more powerful influence than Saturn. Jupiter is four astronomical units closer to the Earth than Saturn, and it has a much greater percentage of mass of the solar system (about .10%) than does Saturn. Jupiter’s average period of revolution around the Sun takes 11.86 years. This period is of much shorter duration than is Saturn’s (29.46 years), which means that Jupiter’s influence comes and goes at a swifter rate of time. Perhaps its influence, when the equation of size and speed is balanced, tends to be equal with that of the slower-moving Saturn. The answer to this question will have to be determined by the physics of the 21st century. I believe, however, that their influence is roughly equal. Jupiter’s averaged-out twelve-year cycle has many remarkable correlations in the historical events. The planet is somewhat eccentric in its orbit; thus its cycle can vary its period between eleven and thirteen years. In the reigns of kings and emperors, in the study of presidents and dictators, we often find a Jupiter cycle that lasts around twelve years. Franklin Roosevelt was president for twelve years and three months. Adolph Hitler governed Germany from January 30, 1933 to April 30, 1945, or twelve years and three months. What is often begun on one Jupiter cycle, if it doesn’t end, evolves to a higher level, when Jupiter returns to that same position twelve years later. The Declaration of Independence horoscope is an excellent representation of the meaning of America. It represents the philosophy of what the Founders desired to achieve, and the Constitutional Chart shows how that philosophy would be carried out. American government experienced a further evolution some thirteen years later, when Jupiter returned to within 10 degrees of the position it was in 1776. In 1789, Jupiter exactly conjoined the natal Jupiter of the Declaration chart. This was the year the Federalist Papers were published,and government under the Articles of Confederation evolved into government under the US Constitution. 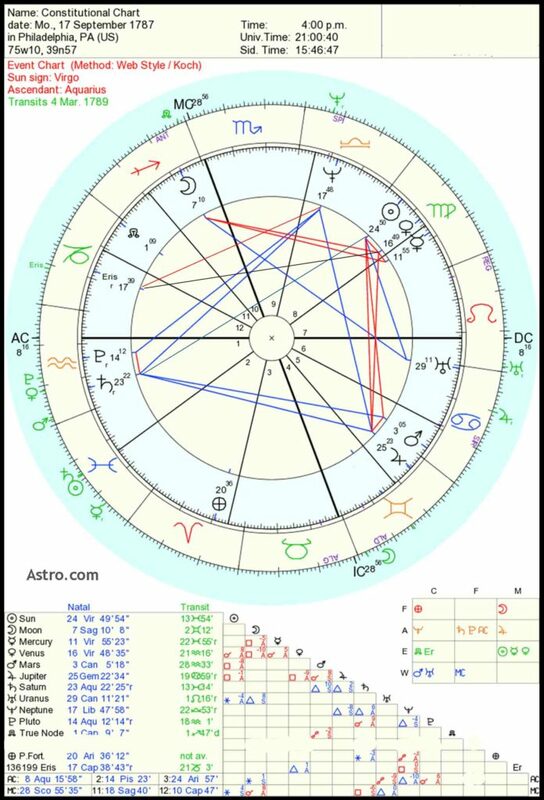 This was the year that George Washington was inaugurated as the first President of the U.S (March 4, 1789, which you can see int the transits below). This was when the first Congress met. Saturn rules those who act as an instrument of the law, whether it be as the police, or the executive, or even a minor state bureaucratic functionary. Jupiter governs the philosophy behind the law. It is Jupiter that gives the law its reason for being. It interprets how the law should be carried out; it determines what the law is. Jupiter rules justices, magistrates, judges, and, God help us, lawyers. Anything to do with the interpretation of the law has to do with Jupiter. In government, this would include the Department of Justice, the Attorney General, the Supreme Court, appellate courts, circuit courts, etc. If one desires to track all the changes in the Supreme Court of the U.S., look to the transits of the outer planets to either the Constitution or Declaration Jupiter. 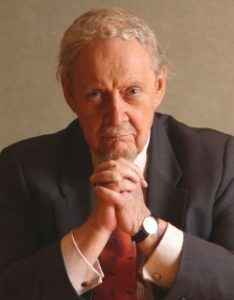 In 1987, Robert Bork, Solicitor General in the Justice Department, was nominated by President Reagan to become a Justice of the Supreme Court. His nomination was opposed and defeated by the Senate Judiciary Committee. At that time, Neptune was exactly opposed the Jupiter of the 1776 U.S. chart. For the first time in U.S. history, there were TV ads purchased on the major networks to oppose the nomination of a Supreme Court Justice. The candidate was accused of all sorts of malpractices. The whole affair was a circus for the media. An outer planet opposition (by transit) to a natal position in a nation’s chart can imply a challenge. The archetypal nature of the planet will determine the kind of challenge to be faced. In the example of Robert Bork, the challenge was sleazy in its nature. The power of the Neptune opposition to natal Jupiter (in the 1776 chart) remained. 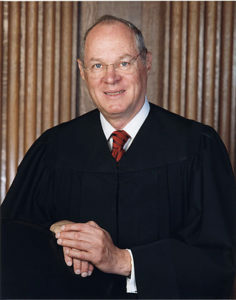 The judge withdrew from the nomination. Another candidate was presented, whose judicial philosophy was somewhat like Judge Bork’s. During the background investigation, it was discovered that many years previously the new candidate had smoked marijuana. Under the continuing Neptune influence, this candidate also withdrew his nomination. When the next candidate was presented (at the time of the Saturn Neptune conjunction with Saturn moving into the opposition of that 1776 Jupiter), the new candidate for Justice, Anthony Kennedy, though less controversial than Robert Bork, and seemingly more conservative than the previous two candidates, was approved by the Senate, and joining the Court, he gave it a seeming conservative majority. Yet over the years this justice grew to be very liberal. Here we see how the influence of Neptune can last for decades. Jupiter in a nation’s chart is an indication of its foreign policy. This planet will describe the relations a nation will have with other countries. In the 1776 and 1787 U.S. charts, Jupiter rules the Department of State, the Department of Commerce (as it relates to foreign trade), the C.I.A., and several other minor bureaucracies. In 1917, when the U.S. declared war on the Central Powers and began sending material and troops to fight in France, transiting aspects at that time primarily involved Pluto making the conjunction to the U. S. Jupiter. This war involved the death of old beliefs– a thousand years of European feudalism, the rule of nobility, and monarchy was dying. Transits of Jupiter often bring peace and prosperity. In the traditional astrology of past eras, the planet was known to have this influence. Here the traditionalists are correct. When Jupiter enters into a retrograde cycle, however, that is, when it is moving backwards in apparent motion in relationship to the Earth, its influence changes. Retrograde motions of Jupiter have occurred during many slow-downs of the economy, called recessions and depressions. Its influence can cause economic slumps just as easily as any Saturn transit. Retrograde aspects from Jupiter, including trines and oppositions, tend to burst the bubble of economic expansion. The 1929 Wall Street Crash occurred around October 24-29, 1929, took place under a retrograde Jupiter ( 15° Gemini Rx, Oct.29, 1929); the October Crash (October 19th) of 1987, known as Black Monday, occurred right in the middle of the retrograde cycle at the astronomic opposition (the opposition was exact at 14:33 hrs. GMT on Oct. 18: Sun at 24° Libra, Jupiter at 24° Aries). If you examine the official U.S. Bureau of Labor statistics, you will find that this is true of many other recessions. During the retrograde Jupiter phase, the Earth in its orbit passes exactly between the Sun and Jupiter. For a few days they line up in a straight line. Called in astronomy the opposition, this is when Jupiter is closest to the Earth. Remarkable people are born during this opposition, and extraordinary events can happen on the planet. A retrograde Jupiter cycle acts to deflate, to balance what has been over-expanded. 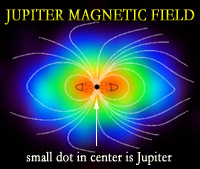 Jupiter in its retrograde phase can rule contraction. That certainly happened to the markets in Oct, 1987, when the value of securities, as expressed in price/earnings ratios, was highly over inflated. At the opposition, when it is closest to Earth, Jupiter influence seeks to put things in balance. That was the effect it exerted on an over-valued securities market in October, November and December of 1929. This planet will sometimes overemphasize a cultural quality. Sometimes the focus is on a law that is out of balance. Interesting laws are passed during retrograde Jupiter. Some of Jupiter’s close visits to the Earth exert a more powerful influence than at other times. Since its orbit is relatively eccentric (0.048), it comes closer to our planet at sometimes during the astronomic opposition than at other times. Other factors determinant in influence would include the line-up or configuration of its Galilean Moons: Io, Europa, Ganymede (largest moon in the solar system), and Callisto. Read more about Jupiter cycles here and here.